the common lime (Tilia x europaea): a hybrid of small leaved and broad leaved lime. The small leaved lime was a dominant tree in the forests that formed in the UK after the Ice Age - especially those that formed in the lowlands of the South and east. The small leaved form is now relatively unusual in the U.K., but limes are often to be seen in parks and city streets / roads. Limes are sometimes known as Lindens or Basswoods. 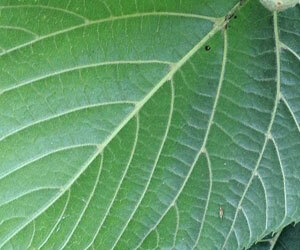 Simple broad leaves: the two halves of a leaf are not symmetrical. The leaf margin may appear complete at first glance, but in fact there are many tiny teeth. Limes attract aphids (greenfly & blackfly) which feed on the leaves, producing a sticky honeydew: think twice before parking your car beneath limes! Veins are prominent on the underside of the leaf. The common lime has small tufts of cream / white hair in the angles of the veins. 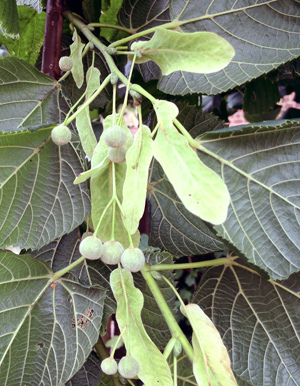 The small leaved lime has brown/ red tufts. 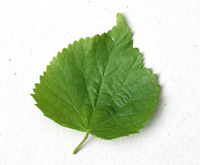 The top surface is darker in colour than the lower surface.The small leaved lime (Tilia cordata) has heart shaped leaves. Buds alternate along the shoots, and may have a slight red tinge to them. 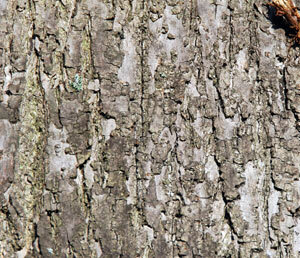 The bark is somewhat grey, with darker grey fissures. 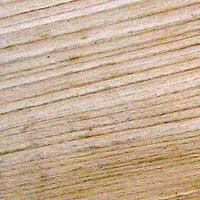 The wood is much used / desired in wood carving or turning. Flowers, which are yellow-white and have 5 petals and sepals, hang from a long, narrow leaf-like structure called a bracte(ole). 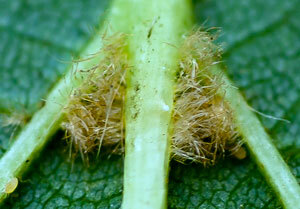 The one seeded fruits also hang from this structure, when formed - which helps in dispersal. 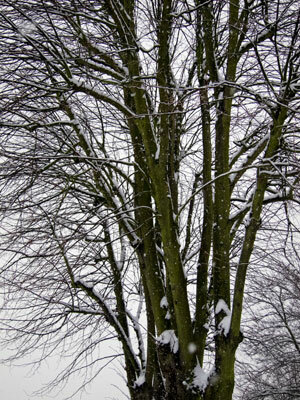 Left : Lime tree in winter. 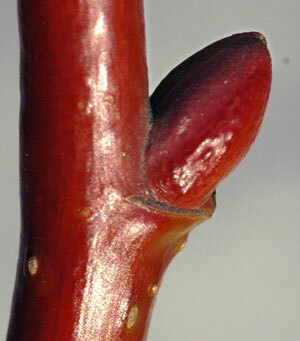 The lime has (shiny) red-brown buds and twigs.